When you think of irrigation, you might picture the simple sprinkler systems that are so common in residential gardens. However, more complex systems are required to provide the volume of water and spread needed for irrigation on a larger scale, as on farms. 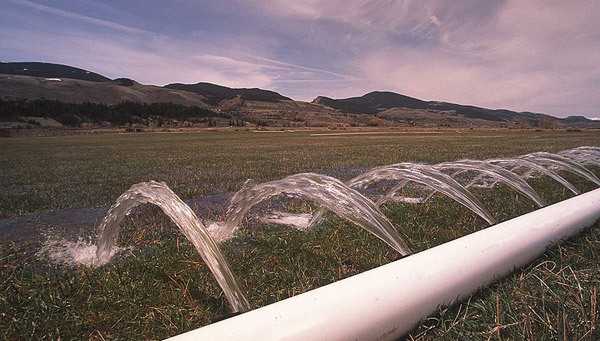 All irrigation systems need the basics, such as access to water, sufficient agricultural piping – usually in the form of polyethylene piping – and pumps. 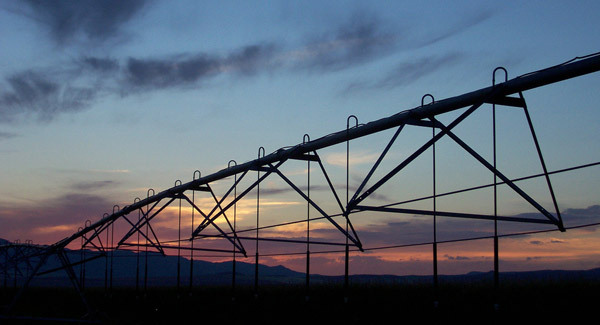 Different landscapes, weather systems and crop types require different irrigation systems though. 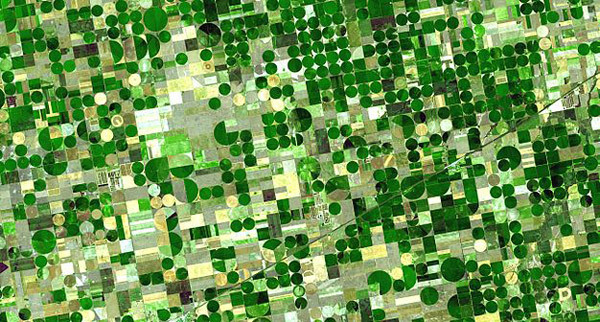 In this photo essay, we look at beautifully captured examples of farm irrigation in all its manifestations. 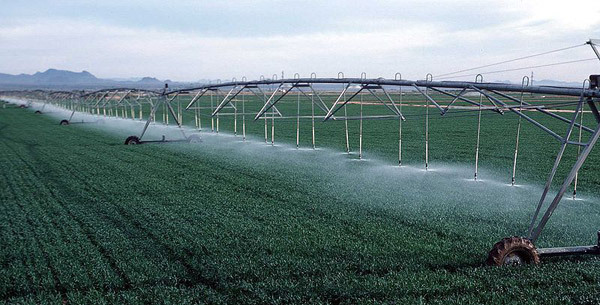 This form of irrigation is best suited to circular crops. As the name suggests, a linear sprinkler line rotates around a central pivot, effectively covering the entire crop. The segments of galvanised steel or aluminium pipe from which the sprinklers hang are joined and supported by trusses mounted on wheeled towers. Centre pivot irrigation system lend themselves to flatter areas of land, where the immense irrigation rigs can rotate without impedance. 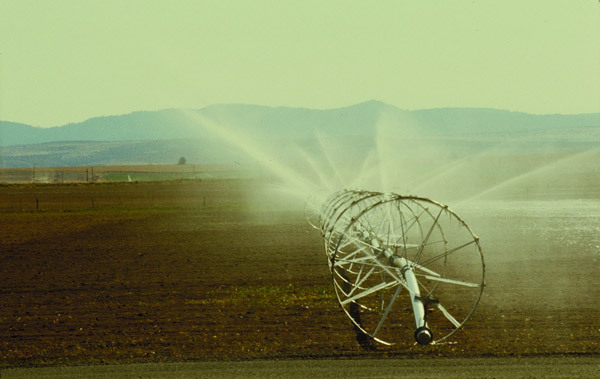 Also known as a “side roll” or “wheel line” irrigation system, a lateral move system uses a series of connected pipes with wheels at 1.5-metre intervals. 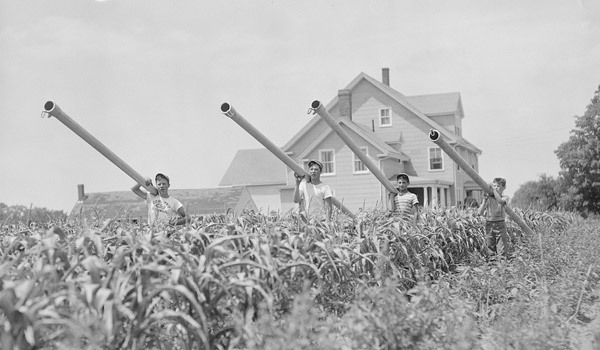 The wheel line starts at one end of a field and, after irrigating an area for sufficient time, the hose is disconnected and the line is either manually or mechanically rolled 10 meters across the field. The hose is then reconnected and the irrigation continues. This continues until an entire crop has been watered. Although this is a more labour-intensive method than the use of a centre pivot system, it’s cheaper to set up and is more adaptable to crops of different shapes and sizes – including crops in hilly or mountainous regions. 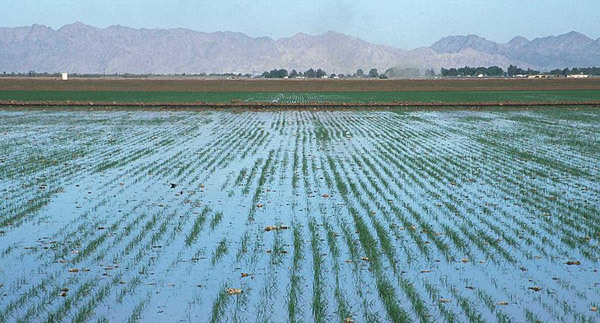 Commonly used for the irrigation of wheat and rice crops, basin flooding involves using the natural lay of the land in areas surrounded by earth banks to flood an area with water until the desired “soil deficit” is reached, or the soil has absorbed enough water. With the advent of laser levelling and land grading technology, farmers can now create large rectangular basins that lend themselves to flooding, rather than needing natural earth banks. In furrow irrigation, small parallel channels are created along the length of a field in the direction of its predominant slope. Water is supplied to the top of each furrow and gravity forces it along the furrow’s length, effectively irrigating an entire field. 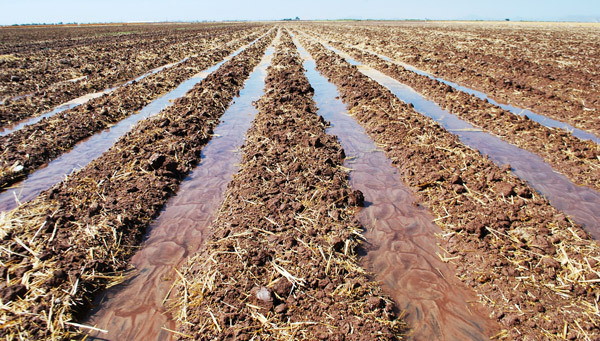 The soil needs to be just right for furrow irrigation to be effective. If the soil is too loose and the infiltration rate of the water is too high, the top of the furrows will be irrigated better than the bottoms. A gated pipe – essentially a pipe with strategically spaced and sized outlets for water – is used in a number of irrigation systems. 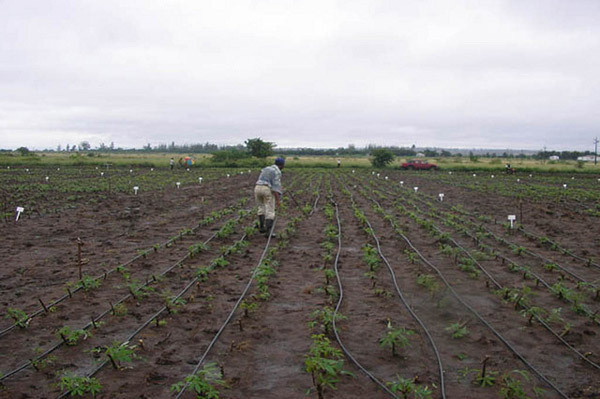 A gated pipe can be used to feed a furrow irrigation system or a basin flood. 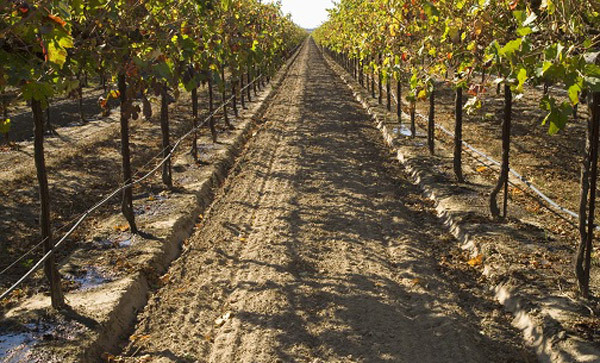 Also known as “trickle” or “micro” irrigation, drip irrigation is one of the best for conserving water. Accordingly, it’s often used in areas that suffer from drought. This system, consisting of piping with a series of valves, allows water to drip slowly but directly onto the soil directly above the roots of plants. Drip irrigation has been recognised as one of the most important innovations in agriculture in the last century, helping to make otherwise arid areas farmable.